Surprise, surprise: Pre-ordering Mass Effect 3 will net you bonus in-game content, but doing so from GameStop will provide you with the most items. Pre-orders are big business with videogames, and studios often sweeten the deal by offering exclusive bonuses to those who are willing to put down a little cash ahead of time. With Mass Effect 3, BioWare has kicked things off by revealing the in-game items it'll give you in exchange for pre-ordering the game. According to BioWare, folks who pre-order Mass Effect 3 will get to kit out Commander Shepard with both unique weaponry and armor. First off, if you pre-order the game from any retailer, you'll get the M55 Argus Assault Rifle. 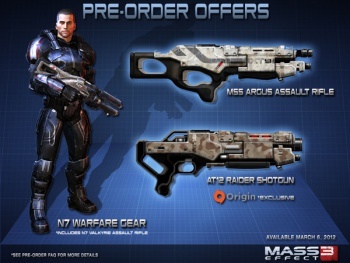 A pre-order from Origin will net you the AT12 Raider Shotgun, too. Finally, if you pre-order from GameStop, you'll net the N7 Defender Armor and the N7 Valkyrie Rifle (you'll still get the M55 Assault Rifle, too, though). After the carnage of the Battle of the Citadel, Alliance officers commissioned a new rifle for their ground forces. A variation of the popular Avenger design, the Valkyrie is now standard issue for new recruits. Exceptionally well-crafted, accurate, and packing ample firepower, the rifle is a hot black-market item on the rare occasion it surfaces. The Defender Armor is a variation on the N7 Special Forces' combat gear, built to protect soldiers in long-running engagements where reinforcements may be sparse. When the wearer fires a weapon, the suit's computers divert energy from the main power cell to the gun's kinetic coils, offering an extra punch. The Defender's storage compartments are designed to hold spare thermal clips, while capacitors throughout the armor provide extra power to shields during critical moments in battle. The armor also comes with an injection system built into the suit and neural-linked bio-monitors that help adjust the wearer's breathing rate and adrenaline levels. Let's be honest about something: BioWare and EA just gave GameStop a huge advantage over other retailers and I'm not sure this will sit well with them for long. There is literally no reason to pre-order Mass Effect 3 from anywhere else if you're hoping to pick it up for a console.